Welcoming 4 bed/3 bath corner family home in exclusive gated community of Cutler Bay/ Gables by the Sea. Bright and spacious layout featuring a beautiful indoor courtyard, formal living areas, large eat-in kitchen with breakfast area, large pantry with plenty of storage, double zoned A/C, 2-car garage, circular driveway and second driveway on west side of house. Beautiful travertine & marble floors through out. Family room leads to covered and screened patio with sparkling pool. Perfect for entertaining. Fabulous single story family home CUSTOM BUILT in 2009 at a great price. Come see yourself, spacious 4 bedroom and 4 1/2 bathrooms. Newly polished marble floors. Gourmet kitchen with wood cabinets & granite countertops. Two car garage w/ porte-cochere entry. Huge terrace for entertainment. Impact windows and doors. Guest house with 1 bedroom, 1 bathroom and living area (Perfect for in-laws). Gated acre+ estate on 47,480 SF Lot. Large driveway for plenty of parking and a pool area perfect for many events. JUST REDUCED!! Charming 3 bedroom & 2.5 bath waterfront home in the premier location of Las Olas Isles. Open plan with master bed & family rm french doors opening to water & oversized pool. Updated spacious kitchen & plentiful cabinetry. Electric & gas available. Special touches include a fireplace & outside shower. Boaters dream with NO fixed bridges & ocean/intracoastal waterway just minutes away. Short walk to the beaches & restaurants on famous Las Olas Blvd! Easily accessible to airport & highways. One of a kind custom built estate in North Miami Beach. This home is located on an oversized 17,600sf corner lot in the sought after community of Skylake. The estate features 4,814sf under air, 7beds, 5baths, 1 den, 2 car garage, Multiple Skylights, High Ceilings, Marble Floors, Lush Landscaping, Kosher Kitchen, Impressive lake views , Lg dock & oversized Master Suite. Be apart of this area that is booming with new construction & remodeled homes. Raise your lg family. Less than 246sf- Aggressive Pricing. Excellent waterfront property in the best community at Doral. This luxurious 2 story residence in gated community is located in Doral isles, a resort style-living with clubhouse,gym,3 pools,soccer field, baseball field and basketball court, 6 tennis brand new courts, kids playground and 2 private party events salon and almost 2 miles walk and running path with beautiful trees. Lovely Luxury Doral home, located in the prestigious gated community of Doral Isles Venetia. Great floor plan 6 bedrooms, 5 baths, includes an in-law or maid quarters, large family room , formal dining, breakfast area, marble floors, amazing backyard overlooking the lake with a potential for a pool if desired, hurricane shutters, and much more. Looking for New Construction in Weston? Total renovation totaling over $400. Tucked in the boutique community of Palm Island, this custom sprawling one story exudes elegance. Creme Marilee marble floors throughout entire house. State of the art kitchen w/54 inch wood cabinets, SS Monogram appliances, granite counters. All New Marble baths, seamless glass enclosures, Resort style backyard w/ oversized salt water pool,waterfall,fiber optic lighting. New Roof, New Impact Windows & Doors, Circular drive. 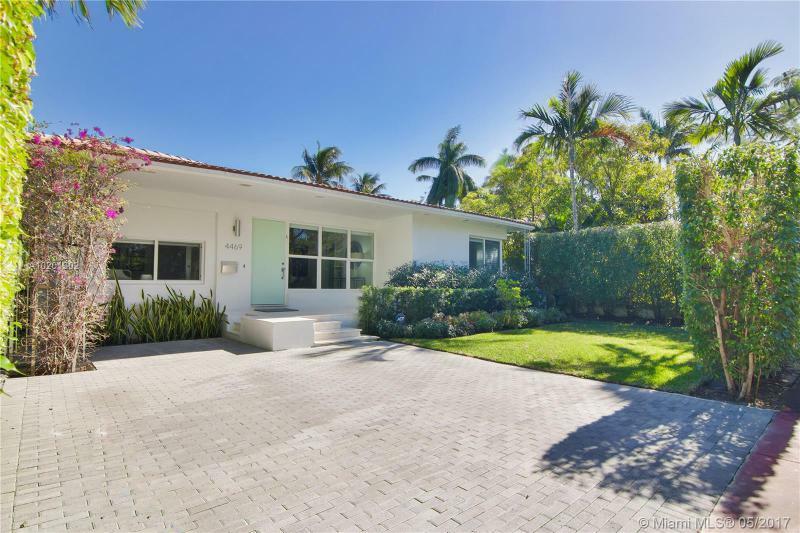 Miami Beach Art Deco Jewel w/ 3B/3BA nestled in the heart of Mid Beach! This home features an open flr plan w/impact wind/drs, formal living & dining areas, eat-in kitchen w/ SS appliances, terrazzo & wood floors, new lighting, AC, & AC duct work throughout the home. Every bedroom has a full bath & closet system. Large backyard. Extra storage space w/separate laundry rm. Property is LARGER THAN TAX ROLL (2,074SF) as per appraiser.